First team make Villa Park! Our intrepid first team and their manager Phil McGuinness completed a sponsored bike-ride today to raise funds for the new season. 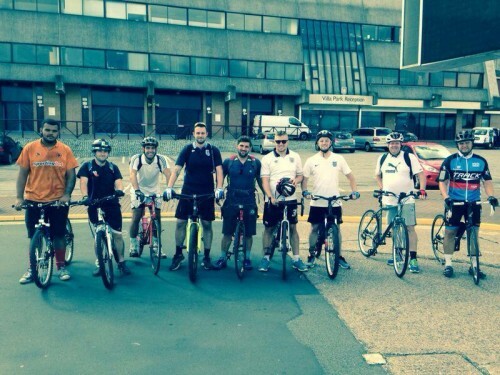 They started at Long Lane and rode to Walsall, West Bromwich Albion, Aston Villa, Birmingham City and Wolves grounds before returning back to Long Lane – a total distance of 50.7 miles! The cost of running the team at West Midlands Regional League Division 1 level is enormous – and late sponsors for any amount would be gratefully received by the guys! Pictured below the team outside Villa Park.